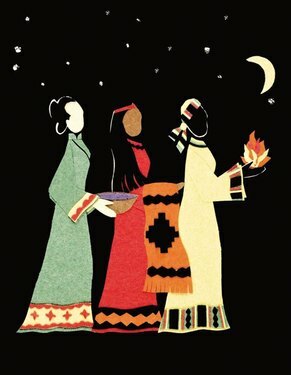 ​There is a custom, rooted in Ireland, of celebrating Epiphany as Women’s Christmas. Called Nollaig na mBan in Irish, Women’s Christmas originated as a day when the women, who often carried the domestic responsibilities all year, took Epiphany as an occasion to celebrate together at the end of the holidays, leaving hearth and home to the men for a few hours. Celebrated particularly in County Cork and County Kerry, the tradition is enjoying a revival. Whether your domestic commitments are many or few, Women’s Christmas offers a timely opportunity to pause and step back from whatever has kept you busy and hurried in the past weeks or months. As the Christmas season ends, this is an occasion both to celebrate with friends and to spend time in reflection before diving into the responsibilities of this new year. The Women’s Christmas Retreat is offered in that spirit. This is an invitation to rest, to reflect, and to contemplate where you are in your unfolding path. Mindful of those who traveled to welcome the Christ child, and who returned home by another way, we will turn our attention toward questions about our own journey. For more information, contact maryrosmus@battenkillcatholic.org.